The Circulating School in Ferwig in 1740-41 had 98 pupils. In 1746-47 there were 56 pupils. For 1751-52 there were 71 pupils, falling to 50 for 1752-53 and rising back to 60 for 1753-54. 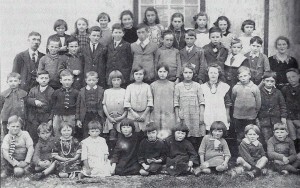 In 1755-56 there were 62 students. 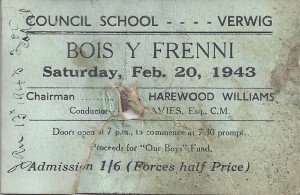 Cwm was the venue – earlier schools having occupied Ferwig Church. In 1756-57 the school was held in Ferwig Church again and there were 47 pupils. In 1760-61, 58 pupils attended at Cwm, Ferwig. Rev. John Thomas, Curate, was acting as a teacher at Ferwig in 1765. David James was teaching in Ferwig in 1776. On July 8th 1868 there were 23 pupils at the temporary Ferwig schoolroom. On 8th September 1876 tenders were sought for building a Board School here. The successful tender was that of William Woodward, Caerleon House, Pendre, Cardigan, for £376. Cardigan brick was used in the construction. Nearby, a house called ‘The Old Schoolroom’ betrayed by name its’ original function. In October 1876 uncertified teacher John Evans was elected headmaster. The new school opened on 8th June 1878 and was designed to accommodate 80 pupils. On 14th August 1883 Ellen Davies became an Assistant Teacher here until 31st December 1883. On 15th January 1884 M. E. Adey became the Assistant Teacher. On 7th November 1887 Margaret Davies, Assistant Teacher and Sewing Instructor, ceased duties. On 13th January 1890 Griffith Huw Mathias, Bridge Parade, Cardigan, became the headmaster until 1895. In February 1895 he resigned after five years as Headmaster. On 6th February 1895 there was a presentation to the departing Griffith Huw Mathias and Margaret Davies. On 25th February 1895 Samuel Robert Maltby became the headmaster. On 29th August 1896 complaints were made about the drunken behaviour of Mr. Samuel Robert Maltby, the headmaster. As the incident occurred outside of working hours, the Board took no action. A further summons against Mr. Maltby on 7th November 1896 for the same reason resulted in his written resignation at the end of the month. He then applied for his old post and was re-appointed by the Board on the condition that he kept sober during school hours. On 8th September 1897 Samuel Robert Maltby resigned. On 19th December 1924 John Williams retired and on 5th January 1925 Mr. W. John Morgan became the new headmaster until his departure for the headmaster’s post at Cardigan Boys’ School on 13th June 1931. 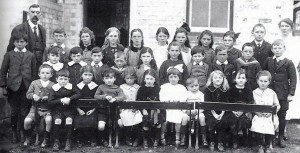 From 1st October 1925 until 26th May 1926 Miss Eluned Lewis was a student teacher here before her departure for Yeovil. On 28th December 1926 headmaster W. J. Morgan married Miss Victoria Maud Chinn of Cardigan. In 1927 the façade of the school building was covered in cement render. In 1931 Miss H. J. Peregrine came here to teach. On 9th January 1932 H. E. Davies became the temporary headmaster. 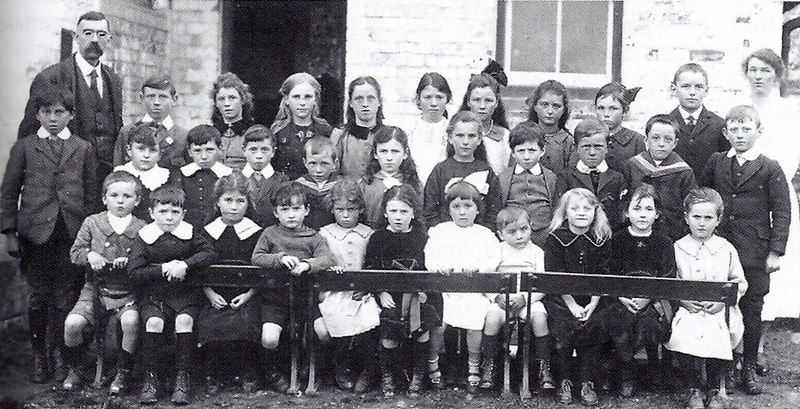 On 4th April 1932 Mary Jones became the temporary head-teacher. On 9th January 1933 John Evan Davies became the headmaster. In November 1947 a new school canteen and kitchen opened. In 1949 electricity was installed. On 3rd October 1950 Nellie Evans retired and Mary James became the Infants’ Mistress. On 30th April 1959 Mary James retired. 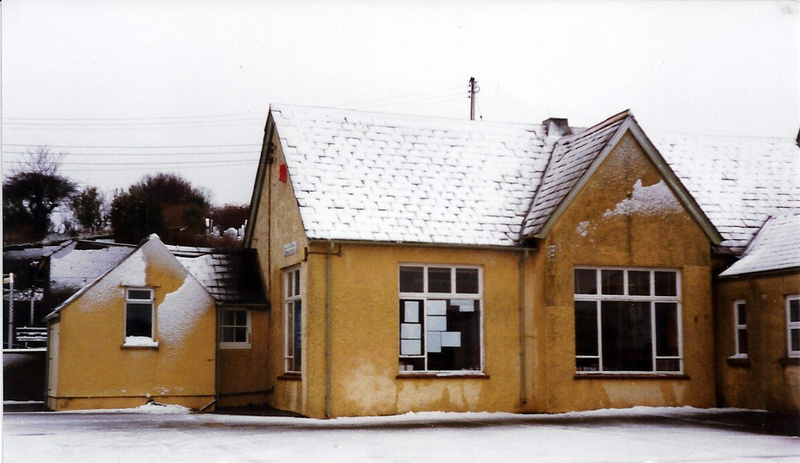 From 4th May until 8th September 1959 Mrs. E. M. Evans worked here as a supply teacher. Her successor was Mrs. M. M. Tyrer. In July 1968 John Evan Davies retired after 35 years as headmaster. On 3rd September 1968 Mr. J. M. O. Jones became the headmaster until 20th July 1977. On 5th September 1977 Mr. J. Edward Morgan became the headmaster. On 9th July 1980 Mrs. M. M. Tyrer left. In September that year Delyth Lewis joined the staff temporarily. On 8th January 1985 Mrs. Deanna Hywel and Mrs. Rhian Selby joined the staff. At the end of the summer term in 1990, Mr. J. Edward Morgan retired as headmaster. In July 2004 Deanna Hywel left. In September 2004 Clive Rees became the last headmaster and remained in post with Rhian Selby and Gaynor Jones until the school closed. In June 2005 the school was threatened with closure. It closed in July 2006. Hi Nick – sorry for the long delay in replying – still settling back in after a long internet-less period. I’m afraid that the copyright of the picture belongs to Janet Joel and I’ve not got the authority to let anyone else use it. If you want to use anything else I have on Ferwig you’d be very welcome.